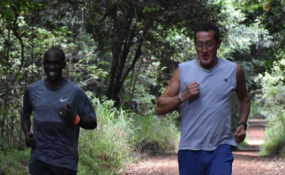 Olympic champion Eliud Kipchoge with CNN Anchor Richard Quest at Karura Forest. I have never been to Nairobi, or even Kenya. As someone who travels almost constantly, this is a serious omission on my part. It is certainly not by design. On the occasions where the opportunity has presented itself, the stars just haven't quite aligned. This week I am able to right this long-standing wrong. After many years of travelling, this trip will also offer a rare opportunity: a completely new experience. Just over a week ago, I boarded what is currently the world's longest flight: Singapore to New York. Now I'll admit that I'm a bit of an aviation nerd - there is something magical about these great metal birds that blast their way into the sky, defying gravity and whisking you above the clouds to somewhere new. However, this was something else: a new frontier, something that truly pushes the boundaries of technology and takes the state of the art that little bit further. I loved every moment of all 18 hours of it. It was a new, unique experience. This week I'm sure will bring a similar sensation. Of course I know things about Kenya and East Africa, I've interviewed many of Kenya's business leaders and politicians. I've spoken at length to colleagues who have reported on all the twists and turns of the country's economy. I know about its growing promise, the challenges and the pace of change. I've seen the ambition, the ideas and the energy that emanate from Kenya. I've read about the architecture, heard the music, and looked at photos of the art. But this week, finally, I will have the chance to listen and learn for myself, on the ground, in the thick of the action. It's a rare and wonderful opportunity. I am excited. There is so much to see and do. I cannot wait. Richard Quest is a CNN news anchor. He arrives in Kenya Monday, October 22, 2018 and will be sharing his experiences in Kenya exclusively on Nation.co.ke.